This post was sponsored by Dumb Ways Jr and The Motherhood. However, all thoughts and opinions are, as always, 100% my own. I’m sure at some point and time we have all heard of Dumb Ways to Die. The original, highly popular Dumb Ways to Die campaign began as a PSA in 2012, encouraging safe behavior around trains, train stations/platforms and at level crossings. Delivered in an entertaining way, it effectively communicates the message that it’s dumb to take risks that can have serious consequences – especially around trains. And the message is getting through. But the graphics are a bit too gory for a younger audience. 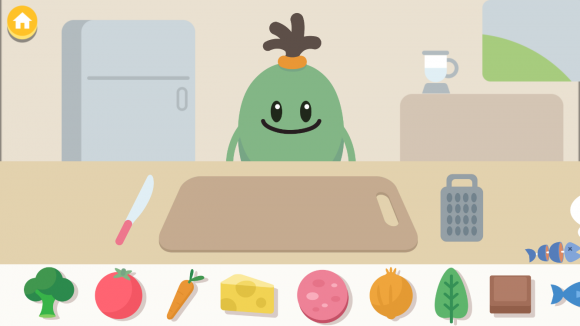 The Dumb Ways team is back with some fun new apps designed just for kids. Dumb Ways JR Loopy’s Train Set and Dumb Ways JR Boffo’s Breakfast are both geared for kids ages 3 to 7. They were designed to teach safety in a fun way that makes kids pay attention. But they are missing any gore or violence that you don’t want your kids to see. Before we talk about the apps, can I just say that even though my son is 10, he still had fun checking out the apps. My 5 year old daughter was engaged, laughing and it provided a great way to talk about safety. Dumb Ways JR Loopy’s Train Set was a favorite with my son. What boy doesn’t love trains? In Loopy’s Train Set, players can select from two modes of play: Drive or Build. In Drive mode, children interact by using onscreen controls to drive Loopy’s train around a prebuilt track. The design encourages children to create their own narratives as they assist passengers to board and exit the train as well as select the train speed and more points to alter the route. 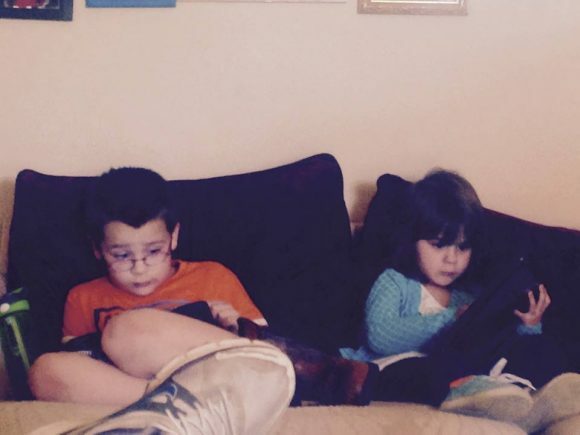 In Build mode, the children are the makers. They create their own train track by arranging and connecting different-shaped pieces of track. They can also add items such as houses, trees and animals to their scene. After they have built some track, players can drive the train along it. Children can learn about various aspects of train safety in the app such as the characters cannot cross the tracks and the boom gates at the level crossings automatically come down when the train approaches. Dumb Ways JR Boffo’s Breakfast was a lot of fun. 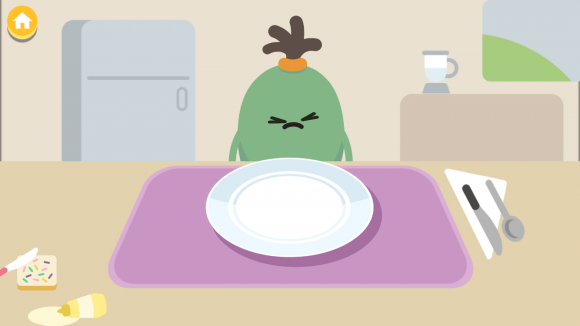 In Boffo’s Breakfast, Boffo is hungry, and your child is his personal chef. You can make him an awesome cooked breakfast by chopping and grating ingredients. You also add sloppy items such as eggs and milk, stir the mixture, cook it, add seasonings, and serve their meal to Boffo. There are enough ingredients that you can come up with so many combinations for meals. This app engages children in fun, imaginative play where players can create endless food mash-ups for a hungry Boffo. Boffo is not a fan of chocolate mixed with red peppers and sprinkles. His face shows his disapproval. Boffo reacts differently when he bites into a whole chili or when weird ingredients are combined – sprinkles with eggs just don’t go well together! It came a sort of side game to see who could create the grossest meal for Boffo. Players create fun meals from 20 ingredients, learn about food combinations and experiment as they tap, stir, mix and swipe. 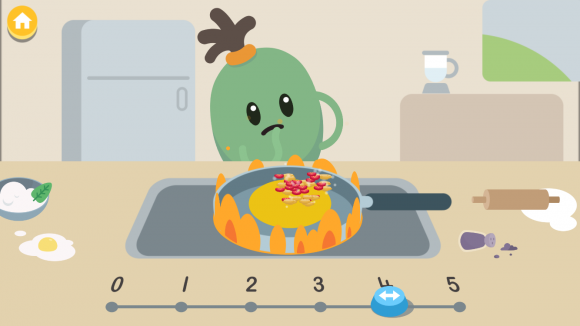 Children can learn about various aspects of kitchen safety in the app such as when Boffo gets worried when the heat is too high on the stove cook top. It provided the perfect way to talk about hot stoves and why Boffo looked worried. We also got to talk about knives and how sharp they can be. 2) Multi-sensory and multi-modal elements appeal to a range of senses, allowing for gesture, audio, images and animations. 3) The apps provide an appropriate level of challenge so that children develop a sense of mastery, create their own narratives and games using the provided elements, and perform constructing and deconstructing tasks (e.g., combining ingredients to create a meal). 4) They also aim to appeal to children’s sense of humor (both anticipated and unexpected) with engaging characters. You can download Dumb Ways JR Loopy’s Train Set on Apple or Google Play and Dumb Ways JR Boffo’s Breakfast on Apple or Google Play. But sure to connect with Dumb Ways JR on Facebook. And Dumb Ways JR on Instagram.